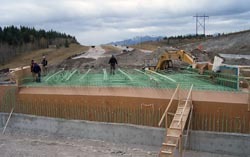 Description: This project involved the demolition of the existing concrete girder bridge and the installation of a concrete box culvert for the two lanes of east bound traffic on the Trans Canada highway. 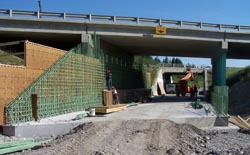 Prior to demolition of the existing bridge, the slab and lower walls of the box culvert were constructed. 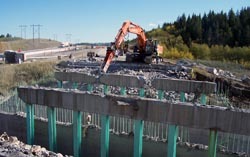 In order to complete the construction of the upper walls and roof, a detour was created, reducing the east bound traffic down to a single lane and shifting them over to the west bound lanes. Trevcon implemented and maintained all traffic accommodation requirements through the duration of the project. Once the upper walls and roof slab were complete, waterproofing of the concrete was completed and the roadway reestablished.